Structural map showing the Northern Flett Sub-Basin. Image source: TGS. The TGS Northern Lights 3D seismic survey (NLx) comprises a merge of five high-quality broadband-processed 3D datasets of over 10,000 km2 in the West of Shetland area. The original 3D surveys were acquired between 2012 and 2014 as a result of industry interest in the area following extensive long-offset 2D acquisition in previous years. The Northern Lights survey images a number of geological basins; this article aims to summarise the known play potential and identify areas of overlooked prospectivity in one of these: the Northern Flett Sub-Basin. Basemap showing TGS 2D & 3D data coverage in the West of Shetland. Image source: TGS. The below seismic section, is an approximate west–east view through the Flett Sub-Basin on the TGS Northern Lights 3D seismic survey. There is a large central ridge formed by a tilted Jurassic fault block with extensive Cretaceous sub-basins either side. In the eastern sub-basin Lower Cretaceous sands of the Cromer Knoll Group are potential reservoirs with a short migration pathway from the Kimmeridge Clay below. They are sealed by Upper Cretaceous shales. Sills intrude into the Upper Cretaceous shales and the Paleocene causing localised uplift, creating potential traps within the Sullom, Vaila, Lamba and Flett sands. There is also potential for reservoir sands to be interdigitated within the basalts, as seen at the Rosebank discovery. Above the intrusions, the Balder also shows evidence of uplift. Eocene fan systems are present in this area and show characteristic bright amplitudes. Seismic section of the Flett Sub-Basin. Data source: TGS. Since 1972, 151 exploration wells have been drilled West of Shetland and discoveries have been made in intervals from fractured Lewisian basement through to Eocene-aged sediments. Such as the Clair, Lancaster and Schiehallion fields, demonstrate the significant potential of the area. In the Tobermory and Cragganmore fields have increased interest in the northern region, but the recent industry downturn has slowed exploration further to the north and east. TGS have continued to show commitment to the West of Shetland region, acquiring multi-client seismic data in areas that we believe hold future potential, such as the extensive Northern Lights 3D covering the northern limits of the Flett, Foula and Erlend Sub-Basins. The West of Shetland area is characterised by southwest – north-east trending sub-basins separated by Palaeozoic ridges. The Caledonian mountain-building orogeny caused uplift throughout the area, and the Old Red Sandstone continental redbeds were deposited in intramontane basins, forming the dominant sediments associated with the older Palaeozoic highs. Mesozoic rifting formed the Flett Sub-Basin, resulting in deposition of thick Middle Jurassic to Paleocene sediments. In addition to this, the North Atlantic opening was heavily associated with volcanics and sills of Upper Cretaceous to Paleocene age, controlling and deforming the basinal sediments pre-, syn-, and post-depositionally. The Jurassic Kimmeridge Clay is present throughout the Flett Sub-Basin and is proven to have reached thermal maturity, generating and expelling hydrocarbons encountered in the discoveries throughout the West of Shetland region. The intrusives form both trapping geometries (inflation anticlines) in structurally-shallower sediments and conduits for migration of hydrocarbons into the younger reservoirs. and the Lower Cretaceous play. 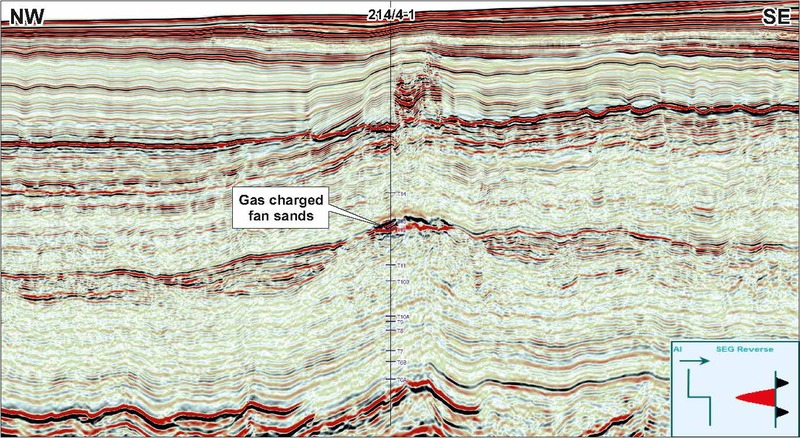 Figure 1: 3D seismic profile through the Tobermory well: 34m column of gas discovered in a four-way dip closure within the Eocene Strachan fan sands. Image source: TGS. The extensive Eocene fan systems are present in the Flett Sub-Basin area and are the reservoir for the Tobermory gas discovery (Figure 1). The fan system contains several hundred metres of predominantly sandy Mid-Eocene fan deposits from the Flett High that are deposited within an Eocene to Oligocene section mostly comprised of mudstones. They exhibit a net to gross in excess of 80%, with porosities of around 30% reported at the Tobermory discovery. This discovery proves successful hydrocarbon charge from the deep-seated Kimmeridge Clay source, with the sills playing an important role by providing the jointing and fractures necessary to create migration pathways for the hydrocarbons, whilst the overlying claystones form an effective seal. Numerous bright amplitudes are evident within the Eocene fan systems to the east of Tobermory into the Northern Lights 3D survey. 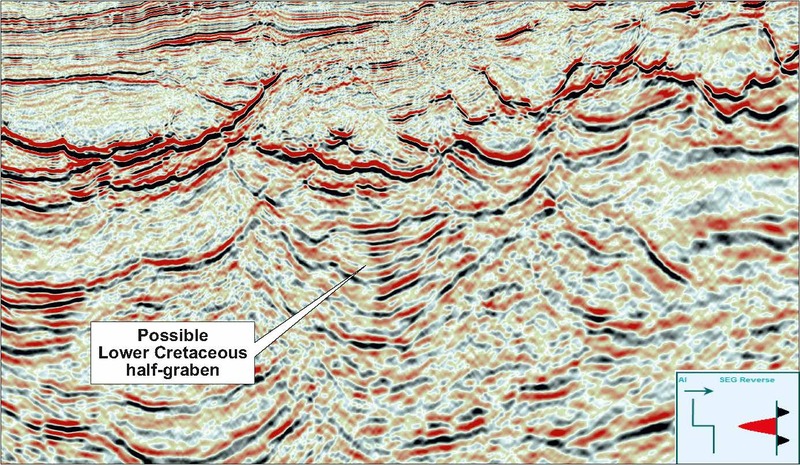 The approximate extent of the fan system can be identified from 2D data; however, the generation of 3D seismic attributes in the Eocene can highlight areas of lower risk reservoir compartmentalisation and higher seal competency which are critical for hydrocarbon exploration. Figure 2: Evidence for inflation anticlines controlling Flett sediment deposition on 3D seismic data. Higher amplitude Flett sediments (between the yellow and blue horizons) onlapping an older inflation-related anticline (A). This is followed by a separate later inversion of the Flett sediments (B). Image source: TGS. The West of Shetland Paleocene play encompasses a number of reservoir intervals and trapping mechanisms, generally sourced by the Jurassic Kimmeridge Clay shales. Sands within the Flett, Lamba, Vaila and Sullom Formations have all been proven through the exploration of the region. 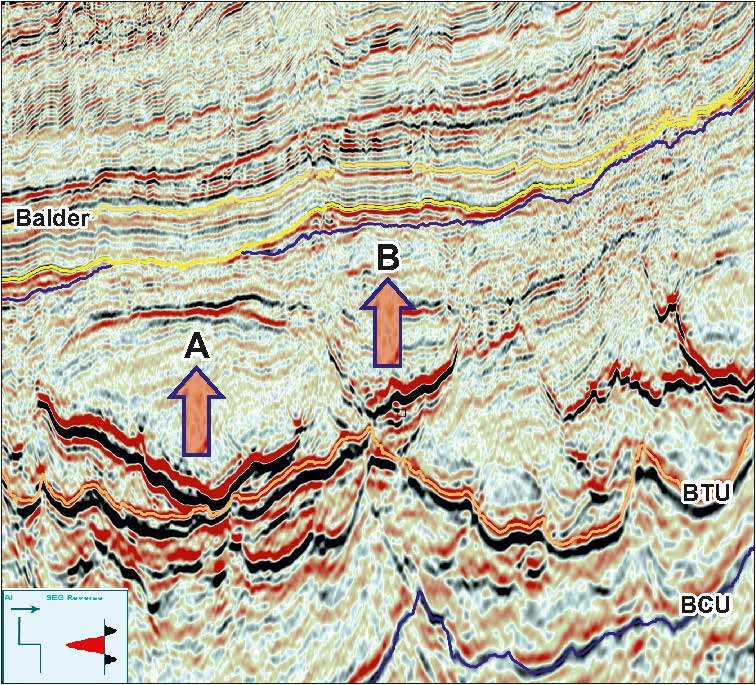 The reservoir intervals are heavily impacted by the presence of co-eval basaltic extrusives and intrusive sills. The existence of intrusives allows for the formation of the well-documented jack-up play: post-depositional uplift of Paleocene reservoirs by underlying intrusive sill complexes, such as the Danian-age Tulipan Discovery in the Møre Basin in 2006. This play type can be readily identified through structural mapping of the key reservoir formations, however, there is further potential to better predict reservoir distribution within the Paleocene by understanding timing of structural uplifts and depositional mechanisms. The 3D data assists in building a geological model to better predict sand presence where seismic identification of Paleocene reservoir is challenging due to the existence of the basalts. Flett reservoir sands are known to interdigitate with basalts, as proven by the Rosebank and Bunnehaven discoveries, however, the strong acoustic impedance of the basalt masks the seismic expression of the sands in these locations. Elsewhere, there remains evidence for sandstone presence controlled by older intrusions. Figure 2 shows an example of Flett-aged sediments onlapping older Lamba/Vaila sediments due to the intrusion below. The onlap suggests these Flett sediments ponded around the Lamba/Vaila forced fold structure (A) formed by the intrusion. Furthermore, it appears that a later Balder-age intrusion has inverted the Flett (B), causing the ponded sediments to sit structurally shallower than the Lamba/ Vaila structure that controlled their deposition. Further study of these sediments and their relationship with the multi-phase intrusions is required; however, this suggests that understanding the local structural timings and depositional mechanisms is critical in play concept development and prediction of lithologies. Figure 3: Evidence for imaging of Lower Cretaceous half-grabens beneath extensive intrusive sills on TGS Northern Lights 3D survey. Possible Lower Cretaceous sediments onlapping basement structure. Image source: TGS. The Victory Formation forms the primary reservoir in this play, charged by the underlying Kimmeridge Clay. Areas where the Lower Cretaceous sediments onlap basement structures form the main targets in faulted combination structural-stratigraphic traps. The major discoveries in this proven play have been found along the West Shetland Platform and the north-east extensions of the Rona and Flett Ridges, however the 219/28-2Z discovery demonstrates the potential as far north as the Brendan Basin. Figure 3 shows an example of a Lower Cretaceous half-graben consisting of sediments onlapping a possible basement structure beneath intrusives. Note the amplitude variation between half-grabens beneath the sills: these seismic facies changes could be mapped on 3D data in this area and potentially used to constrain gross depositional environment maps. Improved imaging is contributing to a much greater understanding of the complexities that exist within this underexplored area and can help to realise the potential of this proven hydrocarbon region. Further refinement of play concepts will help to evaluate exploration targets, leading to potentially highly lucrative future discoveries. Bird, P. C. 2014. Tectono-stratigraphic Evolution of the West Orkney Basin: Implications for Hydrocarbon Exploration. PhD Thesis, Cardiff Univeristy. Coward, M.P., Dewey, J.F., Hempton, M., Holroyd, J. 2004. Millenium Atlas: petroleum geology of the central and northern North Sea. Evans, D, Graham, C, Armour, A, and Bathurst, P (editors and co-ordinators). The Geological Society of London. DECC “Promote United Kingdom 2012” Eocene fan play, West of Shetland. Ellis, D. and Stoker, M., S. 2014. The Faroe-Shetland Basin: A regional perspective from the Palaeocene to the present day and its relationship to the opening of the North Atlantic Ocean. Geological Society, London, Special Publications, 397. While the first deep water wells in the Norwegian Sea failed to reach the Jurassic, significant data improvements may now make it possible to delineate Jurassic targets in deep grabens and structural highs.